Lyon College in Batesville, one of the country’s premier liberal arts colleges, has received recognition from publications ranging from U.S. News & World Report to The Princeton Review to Washington Monthly. Lyon has been placed in the top tier of best liberal arts colleges and named one of the nation’s most socially beneficial liberal arts colleges. The Carnegie Foundation for the Advancement of Teaching and the Council for Advancement and Support of Education have selected more than a dozen Lyon faculty members as Arkansas Professors of the Year. The U.S. Professors of the Year program is among the most prestigious awards honoring professors. Lyon’s record of 14 awards is unmatched by any other liberal arts college in the country. 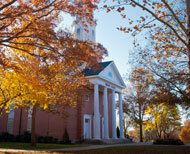 Founded as Arkansas College by the state’s Presbyterians, Lyon College opened in September 1872 in downtown Batesville. It moved to its current location in 1954. During the 1970s and 1980s, President Dan West oversaw the implementation of significant reforms to the curriculum, innovative fundraising techniques and development of the Scottish Heritage Program. In 1994, the school adopted the name Lyon College to honor the Arkansas family that had served it with distinction for more than five decades. The school also created the state’s first student-run honor system in 1994.